Krystel von Kumberg in World Affairs on 14 May, 2017. 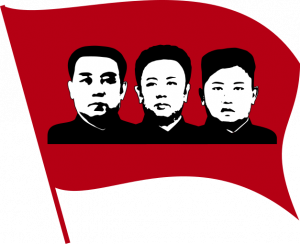 North Korea’s three hereditary leaders – Kim Il-Sung, Kim Jong-il and Kim Jong-un – have ruled their country with an iron fist since 1948. In 2003, the Democratic People’s Republic of Korea’s withdrawal from the Treaty on the Non-Proliferation of Nuclear Weapons to pursue its own nuclear ambitions was to lead to a chain of irreversible events. Pyongyang has increasingly argued that its nuclear program is intended as a deterrent against a potential pre-emptive attack by the United States. The DPRK authorities have praised the nuclear program as one of the greatest achievements of the Kim family’s legacy, defending Juche, North Korea’s self-reliance ideology. In October 2006, North Korea claimed to have successfully tested its first nuclear weapon. In 2013, Kim Jong-Un carried out his first nuclear test as Leader. In 2015, during an exclusive interview with CNN, the deputy director of a North Korean think-tank stated the country has the missile capability to strike mainland US and would do so if the US ‘forced their hand’. Fast forward to 2017, and tensions have escalated as a US aircraft carrier strike group was deployed following North Korea’s missile tests on 5 April. The USS Carl Vinson and three other warships accompanied it. As a US strike group heads closer towards North Korea, Kim Jong-Un warns of nuclear strikes if further US ships are deployed. North Korea has warned of ‘catastrophic consequences’ in response to any further provocations by the US, stating that ‘if the US dares to choose a military option … the DPRK is willing and ready to react to any mode of war desired by the US’. New US president, Donald Trump, greeted this threat with a proposal of unspecified unilateral military action. Trump’s tweet; ‘North Korea is looking for trouble. If China decides to help, that would be great. If not, we will solve the problem without them! U.S.A.’ demonstrates a confident hegemonic stance in which the US is able to deal with the threat alone. This shows that Washington is prepared to act alone if China fails to exert more pressure on its neighbour to halt its missile and nuclear weapons programs, with last week’s American strike against a Syrian base sending a clear warning to North Korea. 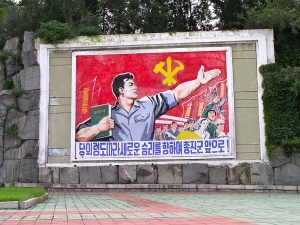 North Korea’s government regularly espouses anti-American and revolutionary propaganda on the streets of Pyongyang, DPRK. The nuclear-powered Carl Vinson’s presence in the area coincides with speculation that the regime could be preparing its sixth nuclear test to coincide the 105th anniversary of the birth of its founder, Kim Il-sung, on Saturday. Meanwhile, China’s foreign ministry has played down reports that Beijing has deployed 150,000 troops on its border with North Korea. Hua Chunying, a foreign ministry spokesperson, has noted that she was ‘not aware’ of such a mobilisation by the People’s Liberation Army along the border. However, with regional tensions building ahead of Saturday’s Kim Il-sung commemorations, Hua said China was ‘closely following’ developments on the Korean peninsula. Indeed, the North Korean threat is clear. North Korean state-owned news-readers (Korean Central Television) warn of a nuclear strike if provoked. A CNN interview with a North Korean insider backed up earlier statements, revealing that North Korea has a nuclear weapon that can reach mainland US and stated ‘we may use them if we are forced by the US to do so’. Is dialogue the best option? When the President of the United States was asked by reporters whether he was willing to talk with DPRK, Trump stated ’absolutely, why not?’ and ambitiously proclaimed that he could ‘talk him [Kim Jong-un] out of those nukes’. 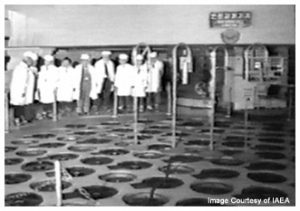 The Yongbyon reactor is suspected of being used for North Korea’s weapons of mass destruction programme, contrary to UN charters and numerous Security Council resolutions. Markey argues that the best outcome would be for China to increase sanctions, facilitating discourse with North Korea, or we will be faced with a continued escalation of the nuclear program and threats. Some stories coming out of Washington at the moment suggest that the US is developing possible plans for the killing of the leader or thinking about the deployment of nuclear weapons inside North Korea. This could lead to an escalation of the conflict and even accidental war. Engaging in direct talks rather than antagonise the DPRK seems to be the lesser of two evils.